The flagship of the Russian Navy, the aircraft carrier Admiral Kuznetsov, is expected to conduct seven months of acceptance trials following the successful completion of the warship’s modernization, slated to be completed in two and a half years, the head of state-owned United Shipbuilding Corporation (USC), Sergei Marichev, told Russian media last week. “In mid-April this year, a contract was signed for the repairs and some modernization works that will last two years and a half, after which seven-month trials are scheduled,” Marichev was quoted by TASS news agency on July 25. The contract between the Russian Ministry of Defense (MoD) and USC for the modernization of the Admiral Kuznetsov was signed last month, following a long delay due to contractual disputes between the two parties including USC insisting that it needed four years to perform the work, whereas the MoD wanted it do be done under an expedited deadline. Last week, Marichev also explained that the focus of the overhaul will be on the engines, propulsion system, and electronics. “In the first place, large-scale repairs of the warship’s main propulsion unit are planned along with the replacement of boilers, the repair and recovery of main geared-turbine assemblies, powerplant compartments, the equipment of turbine and diesel-driven generator units and refrigerating mechanisms,” he said. Last year, it was expected that the Russian MoD would cut the funds allocated for the carrier repairs and upgrades by 50 percent reducing the overall scope of the modernization the warship will undergo. As of now, the detailed budget for the refit has not been revealed but is estimated to be around $400-600 million. As a result of the budget cuts, the carrier’s electronic warfare, communication, intelligence, navigation, and combat control systems will likely not be undergoing modernization. 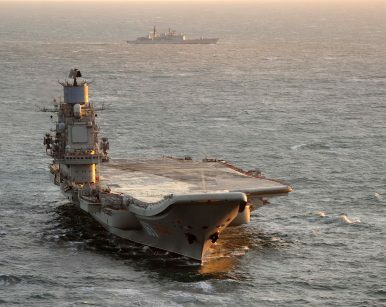 Most work will be confined to the Kuznetsov’s flight deck and its propulsion systems including replacing four out of the carrier’s eight turbo-pressurized boilers while refitting the remaining four. The carrier, however, is still slated to be equipped with an advanced new air defense system– the Pantsir-M/EM air defense system fitted with eight 57E6-E surface-to-air missile launchers (32 missiles in total) and two GSh-6-30K/AO-18KD 30 millimeter six-barrel rotary cannons. The Admiral Kuznetsov, capable of carrying of up to 41 aircraft, was commissioned in 1990 and has not undergone a major overhaul since then. It underwent a smaller scale retrofit between 1996 and 1998. The carrier is expected to return to service by 2021, although a delay is likely.